Guests of the 22nd annual Okanagan Fest of Ale can look forward to sampling the best beers and ciders from 62 craft breweries in Penticton April 7 & 8, 2107. A favourite for patrons and participants alike for over 20 years, this “must attend event” is one of the largest and longest running beer festivals in the Pacific Northwest. The 2-day festival features 175+ quality crafted brews, ciders and cask ales for tasting, fabulous food and great live entertainment in a unique indoor/outdoor venue. “Of the 62 brewers participating, 16 are new to the event and 6 will be offering estate grown and produced ciders” says Simon St-Laurent, Marketing Director for the Okanagan Fest of Ale. “We had an overwhelming number of craft brewers interested in participating this year and are thrilled we were able adjust our floor plan to accommodate over 60 top notch breweries from BC and beyond”. In addition to hosting a record number of brewers at the event organizers are anticipating a full house. “We’ve partnered with local hoteliers to offer great deals on ticket and accommodation packages and encourage guests of the fest to check out what’s on tap in our craft beer friendly town” says St. Laurent. New for 2017 attendees will now be able to track their tastings on the popular Untappd app. “The Untappd platform allows guests easy access to detailed product listings and descriptions for each of the breweries. It’s a great alternative to a printed tasting guide and we encourage guest coming to the festival to check out our venue listing on Untapped at Okanagan Fest of Ale in advance of the event”. “Tickets sales to date have been phenomenal with many guests taking advantage of specially priced ticket and accommodation packages, or opting for weekend passes”. Its shaping up to be one of the biggest and best events yet” says St. Laurent. 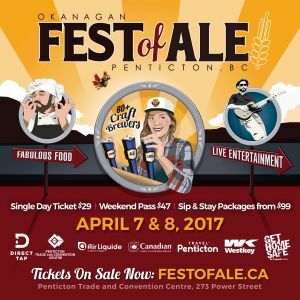 Don’t be disappointed, make your plans to Sip, Savour and Celebrate the best in craft beer and cider at the 2017 Okanagan Fest of Ale today!